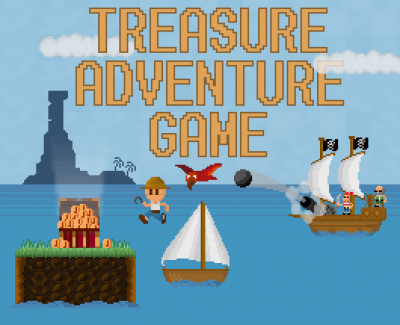 Treasure Adventure Game (TAG) was the debut game Robit Studios developed. It was made entirely by Stephen Orlando over 3 years, with an original soundtrack developed by Robert Ellis. The game's characters and story have been re-imagined in Treasure Adventure World, which is a ground-up remake of TAG featuring improved graphics, features, and gameplay. The game was released on November 26, 2011 as freeware, and garnered positive press and many fans. Treasure Adventure Game casts you in the role of a young boy who lands on an island that is a fragment of what was once a continent, destroyed in the war between a demon and a wizard. You accept quests, travel across the oceans, and generally have a bang-up time of being a little boy in a big world, out there looking for treasure and adventure. Your equipment consists of a hat, a parrot, and a boat that appears whenever you touch water. Combine those with the basic platforming abilities like jumping and crawling that you’re familiar with from every platforming game ever, and you’ve got the basics of a phenomenal romp across a huge world filled with treasure, maps, secrets, danger, and triumph. The music changes with the environments and day-night cycles, enhancing the feel the game is evoking and making you feel immersed in the world as you travel through it. Huge, open, and highly interactive world to explore and a very interesting story to experience. Very diversified environments with changing weather and NPCs that are not static but living their lives. Beautiful music, composed by Robert Ellis, that changes with the background and creates a very unique and enchanting mood. This page was last modified on 10 November 2017, at 19:12.